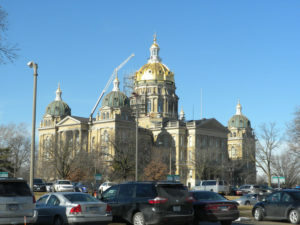 The governor will have to set a date for a special election by the end of the week – to fill the now vacant state senate seat Republican leader Bill Dix held until 2 p.m. Monday. Senate Majority Leader Bill Dix of Shell Rock resigned Monday. It happened shortly after images posted on the political Iowa Starting Line website showed Dix, who is married, kissing a female lobbyist in a Des Moines bar. According to state election law, Tuesday, March 27 is the earliest date an election could be held to select someone to replace Dix in the state senate. The district covers all of Grundy and Hardin Counties as well as parts of Butler and Story Counties. Democrat Tracey Freese had already filed to challenge Dix this fall. She intends to run in the special election. Senator Dix’s name was removed from the Senate voting board yesterday afternoon. His biography was scrubbed from the legislature’s website. Republicans in the Iowa Senate plan to elect a new leader on Wednesday.